Take a look at this charming simple, stylist, mono game with human generated music (by mouth) and you'll fall in love. Like finding Wally or Waldo puzzles this interactive environment animated pages game is simple yet addictive. Each level you have to open doors, hatches, tents, dig holes and more to find the characters and objects listed at the bottom of the screen. 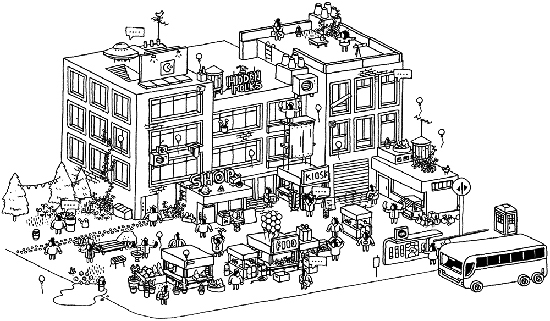 Hidden Folks is a game like Where’s Waldo?, but black and white and interactive: find little people hiding behind or inside things by lifting doors, pressing buttons, and shaking trees. All characters and objects in the game are hand-drawn, scanned in, placed in levels in the game, layered manually, and then animated. All sounds in the game are mouth sounds, because why not. It's supposed to be a relaxing game; no time limits, no points, just a bunch of folks and objects to be found. The game will feature around 20-30 levels with various themes like a camping theme, a desert, a factory, a suburb, and many more. Expect updates with more levels. The game will be published on PC Mac Linux iOS and Android.